Students filled Dodd’s Theater Tuesday, Nov. 12, for what might have been the most anticipated event this semester yet. 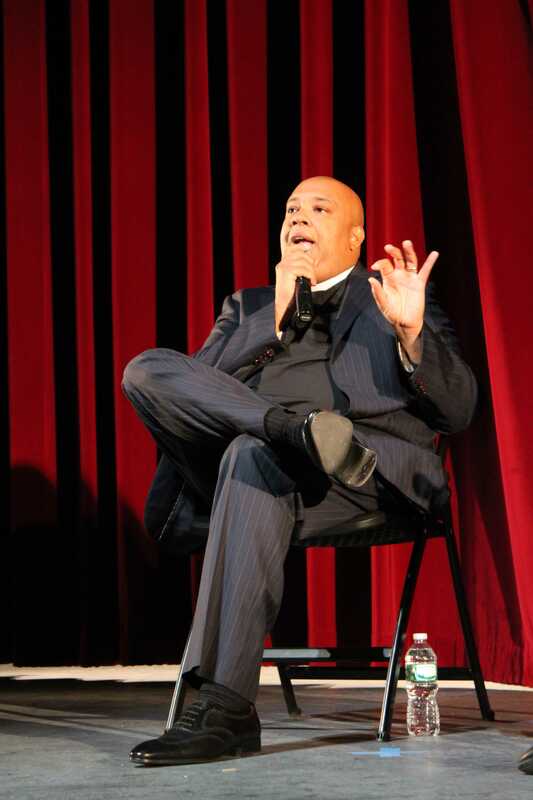 Individuals from all over campus poured into seats with the hopes of embracing some knowledge and wisdom from one of the most legendary players in Hip-Hop history, Joseph “Rev Run” Simmons of the iconic Run-DMC. Since getting his start with Run DMC, Rev found God, became an ordained Pentecostal minister, and opened his home up for all to see in the hit TV show, Run’s House. Over the years he has used his celebrity status to give back in any way he can, as well as write for several publications such as “Take Back Your Family: A Challenge to America’s Parents,” co-written with his wife Justine Simmons. 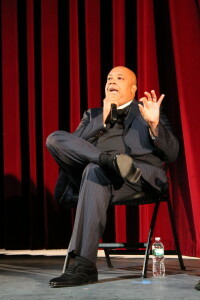 Having so many life experiences, the audience was eager to listen as Rev told stories and gave advice on how he has become both a leader and role model for so many. The discussion began talking about leadership and what qualities make up a good leader; humility was the top trait. “Nobody wants to follow a know-it-all,” he said, explaining that being a leader means being humble, being responsible and being able to apologize when you’re wrong. It’s then, and only then, that you’ll be able to get people to follow you, which is one of the first characteristic signs of a leader. When looking back at his role models he instantly chose his father and older brother, Russell Simmons of Def Jam record notoriety. He cited family as the first place a person goes to for inspiration and leadership, as well as the belief that the lack of leadership within the home is the key component in young kids getting involved in gangs. He also noted that at the height of Run DMC, he began to turn to God and the church for guidance to fill an empty void within himself. Family was also a prevalent topic throughout the evening. It started with his parents. “I didn’t have the bullying type of parents,” he answered when asked if his parents encouraged or discouraged his pursuit of the rap industry. “I never felt judged for my choices.” It was their presence and support that helped him make big moves and follow his dreams. Of course the discussion couldn’t go without a little chat about the hit show, Run’s House, and his family. He works in his household to keep balance amongst his family members, in the hopes that nobody becomes too overbooked or too crazy. He tries his best not to run around much himself, because it is that balance that keeps him from running his body down. Of all the members of his family, it’s his wife’s ambitions that usually go too far. Of course, having one of the hip-hop greats in the room, it was an obvious topic of conversation to ask what Rev felt about the current state of hip hop. Contrary to what most would think…he actually loves it! Among his favorites in the business right now are Drake, Jay Z and Kanye West. Rev and his family’s show, Rev Run’s Renovation, will air Jan.4 on HGTV, and features the house seen on Run’s House getting a top-to-bottom makeover. Reverend Joseph “Run” Simmons and wife Justine Simmons will be hosting their own daytime talk show, according to Always A-List. The couple filmed a pilot for the show before an ABC studio audience in August on the “Live With Kelly and Michael” set (the show was on hiatus at the time). The show’s name has yet to be disclosed, along with other details. This won’t be the first time they’ve appeared on their own show. MTV also aired “Run ‘s House,” a reality series documenting the reverend’s life with his family in New Jersey. It ran from 2005 to 2009. Run, who sold millions of records as one third of superstar rap group Run DMC, has branched into multiple ventures since “Run’s House” ended. This year, he released a book titled, “Manology: Secrets Of Your Man’s Mind Revealed,” along with singer Tyrese Gibson. The book offers relationship advice for women and how they can improve their romantic bonds. Rev Run and Tyrese's new book, Manology: Secrets of Your Man's Mind Revealed. Rev Run and Tyrese’s new book, Manology: Secrets of Your Man’s Mind Revealed.